This year marks the 200th birthday of undeniably one of the most important female pianists and composers of the 19th Century – Clara Schumann. Born in 1819, Clara studied the piano from the age of 5, heavily encouraged by her father, Frederick Wieck. It was not long before she gained the reputation of being a talented and renowned pianist. She boasts a 61 year concert career which helped revolutionise the format and repertoire of the piano recital. At the age of 13 she was one of the first pianists to perform from memory, a practice which has since become common in piano performances. Clara was also a successful composer. Her compositions are comprised of piano concertos, chamber works and choral pieces. Until her subsequent marriage to Robert Schumann, Clara spent the majority of her time on concert tours, teaching and composing. She often performed her own compositions in her concerts around Europe. 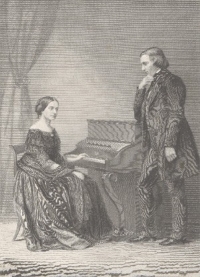 Robert Schumann met Clara in 1828. His admiration for Clara led to his decision to move into the Wieck household in 1830 to study with Clara's father, Frederick Wieck. Despite strong objections from her father, in 1840 Clara and Robert were married. After this, Clara’s musical career began to struggle somewhat with having to deal with household responsibilities, motherhood and increasing involvement in Robert’s career. Clara still performed in concerts after the marriage, but she unfortunately had little time for her own composing and practising. In 1878, Clara Schumann was employed at the Hoch Conservatory in Frankfurt as the first and only woman to hold a position there at the time. To celebrate this anniversary, Breitkopf & Härtel have released a facsimile edition of Clara's flower diary „Berliner Blumentagebuch der Clara Schumann“ (The Berlin Flower Diary of Clara Schumann). The first of the series of flower diaries by Clara Schumann was created in 1854, the year of her husband Robert Schumann's admission into a mental institution. In 1857 Clara began her last flower diary, almost a year and a half after her husband’s death. It reflects the travelling of the pianist who was by now increasingly performing recitals throughout central Europe and England. Also reflected in the diary is her relationships with close friends, including the young Johannes Brahms who had presented her with the little volume expressly for her collections and annotations. The facsimiled diary pages are supplemented by biographical and botanical comments in German text. Edition Peters, in collaboration with the Schumann-Haus Leipzig, has published a new Anniversary Songbook. The 14 songs contained in this album represent the pinnacle of Clara’s art. They were composed mainly in the period after her marriage in Leipzig to Robert Schumann. This volume includes new practical editions of 14 of Clara Schumann’s greatest songs, introductions to each song written by Frances Falling and Schumann-Haus Leipzig, new English translations of the song lyrics, and a CD containing recordings of the piano accompaniments. The songbook is available in both High (Original) Voice and Medium - Low Voice. To complement the High Voice Edition, Peters Edition have also published this edition for Low-Medium Voice containing the same 14 songs. 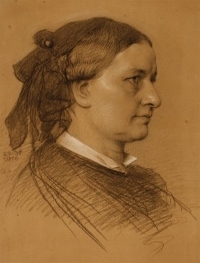 Among the leading pianists of the 19th century, Clara Schumann was a respected published composer in her lifetime, regarded by her contemporaries as a member of the avant-garde "new romantic" school. Praised by such greats as Chopin, Brahms, Mendelssohn, and Liszt, her music is being heard again today in recitals and new recordings. This rare collection, reproduced mainly from the classic Breitkopf and Hartel edition of 1879 is introduced by Dr.Nancy B. Reich. Including 4 Pièces Caractéristiques, Op. 5, Ballade in D minor (No. 4 from Soirées Musicales, Op. 6), Mazurka in G major (No. 5 from Soirées Musicales, Op. 6), Notturno in F major (No. 2 from Soirées Musicales, Op. 6), Romance in A minor (1855), Romances (3), Op. 11, Romances (3), Op. 21, Scherzo, Op. 10, Toccatina (No. 1 from Soirées Musicales, Op. 6), and Variations sur un thème de Robert Schumann, Op. 20. Study/Miniature Score for Piano and Orchestra. Also available as a piano reduction for 2 pianos.